This is a view from above the park. The desert is down at close to sea level and thus my initial attraction to the park, TWISTY mountain roads to get down to it. 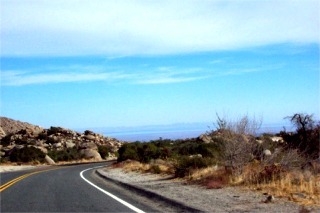 With over 600,000 acres, Anza-Borrego Desert State Park is the largest desert state park in the United States. The park features washes, wildflowers, palm groves, cacti and sweeping vistas. Visitors may also have the chance to see roadrunners, golden eagles, kit foxes, mule deer and bighorn sheep as well as desert iguanas, chuckwallas (a large lizard) and four species of rattlesnake. 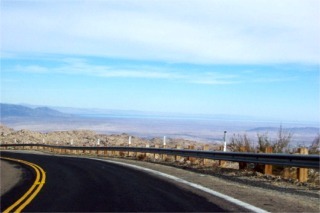 A sample of the road down into Anza Borrego State Park. It was surprising to both of us how pretty and nice the park was. They have done a beautiful job with the visitors center. It is built under a desert garden, and is hidden from the road. Park in the parking lot and take the walkway past the flagpole. It was really quite nice. Off in the distance here there is a thin, horizontal, light blue line. 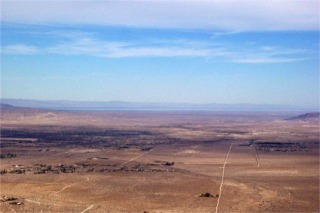 That is Salton Sea which we ended up going to a week or so later. Alas, this day was planned to enjoy the roads and we had other stops to make. I wanted to include Julian for apple pie. Ever since we had been there in September I have had a taste for their apple pie. This a shot of more of the roads. Not as severe as some we have traveled but still pretty twisty. 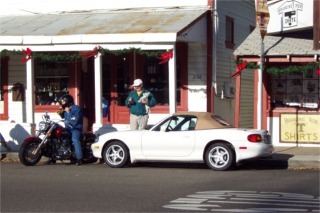 This trip was taken in December and the temperature fluctuated depending on where you were. Down on the desert floor the temperature was very pleasant. I am going to guess close to 80. When we got back into the mountains in Julian it was more like 55. This is a picture in Julian. 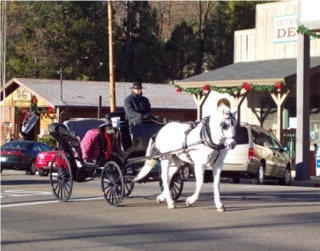 Since it was almost Christmas they had a couple horse drawn carriages to give you rides. Julian began as a California mining camp when A.E. (Fred) Coleman discovered placer gold at Coleman Creek in 1869. Drue Bailey founded Julian City in 1870, naming it after his cousin Mike Julian. By the summer of 1872, there were 50 houses, 3 hotels, 4 stores, 2 restaurants, 1 schoolhouse and the "usual number of saloons" to service an estimated 300 miners working in the area. Unlike other such camps, Julian survived after the mines played out because of its climate, rich soil and proximity to San Diego. Since James Madison brought the first apple trees to Julian in the early 1870s, Julian apples have won many blue ribbons at places like the Chicago World's Fair of 1893, the St. Louis Fair and the San Francisco World's Fair of 1915. 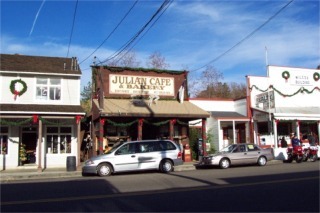 This is a picture of the Julian Cafe. We ate here in September so this time I decided to try the pie somewhere else. Now I need to go back because the pie at the Cafe was better. Hey buddy you're parking that thing pretty close to my car. When we left Julian we decided to just leave the top up. It was getting late in the day and it was getting cold. This was another fun day trip on some wonderful mountain roads. We also decided we need to go back to Anza Borrego to do some hiking. We signed up to have the park notify us when the desert flowers will be reaching their peak bloom in the Spring and we are looking forward to seeing that.